Who are the Friendly Neighborhood Democrats? This is the most common question I have been asked since the Facebook page was created. The answer is simply, "Anyone who wants to help redefine the Democratic Party through direct advocacy." We are a loose-knit group of liberal and progressive activists who believe that action speaks louder than words. What do the Friendly Neighborhood Democrats do? We engage in local community service to actively demonstrate our values in a tangible way. 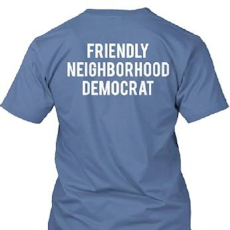 We publicly brand these actions by wearing one of our inexpensive "Friendly Neighborhood Democrats" t-shirts. When do the Friendly Neighborhood Democrats work? We encourage you to find charities that are local to where you live and to offer assistance whenever possible. While we will have a monthly event posted on our Facebook page, we hope that you will take it upon yourself to find ways to be involved in your community. Where do the proceeds from the t-shirts go (and where can I buy one)? The money raised from the t-shirts goes to local charities, not the Democratic Party or any of its affiliates. You can purchase one by going to the link pinned to the top of the Friendly Neighborhood Democrats Facebook page. Why are the Friendly Neighborhood Democrats necessary? For several years I have spent my scarce free time working with various organizations in the pursuit of liberal, progressive, and Democratic ideals. What I noticed is that, for all the long conversations we have over voter apathy, we continue to rely on block walking, email, and phone banks as our primary methods of voter outreach. I'm not trying to say that those techniques aren't still useful. We just need to admit that on their own they haven't been all that fruitful, and they cost a significant amount of time and money. All of our focus typically goes to the presidential campaigns, which comes at great cost to any local and statewide campaigns and advocacy efforts. Add to that a populace which has little memory of Texas Democratic governance, and what we get is the worst voter turnout in the nation. The people have no desire to change the party holding the reins in Austin because at least the Republicans in office are the devils they know. Their image of the Democratic Party primarily comes from the media, which is mostly sports, celebrity gossip, and the partisan gridlock of Congress. But we can change that. Each of us, individually, can have a significant impact on the way those around us see our party. None of this requires funding from the party or significant amounts of time in odious meetings. This kind of year-round action will accomplish several things simultaneously. First, it helps address immediate needs in our communities, such as poverty and hunger. It also creates an opportunity for people at the local level to change their neighbors’ view of our party without needing to spend a lot of money. It builds the base in a meaningful way, and provides prospective candidates a great way to demonstrate their priorities to voters. Lastly, community service transcends language barriers, helping us establish trust and friendship within untapped portions of our population. I believe that this is the best way for the Democratic Party to redefine itself in the eyes of voters. It will take time and effort, but if we all pitch in just a little bit, we can make a significant difference in the viability of our party. Please join me in this effort.